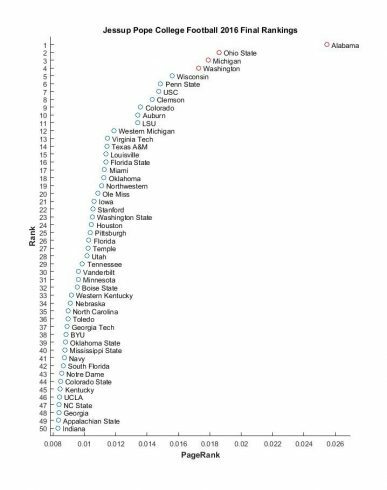 Below is our final ranking dotplot for the season. Note how Alabama ends the season way beyond the other teams, teams 2-4 are grouped together, followed by another large break after the 11th team, LSU. Although Navy’s loss to Army for the first time in more than a decade was a surprise, our rankings did not see them as a top 40 team anyway, so the surprise was rather mild. 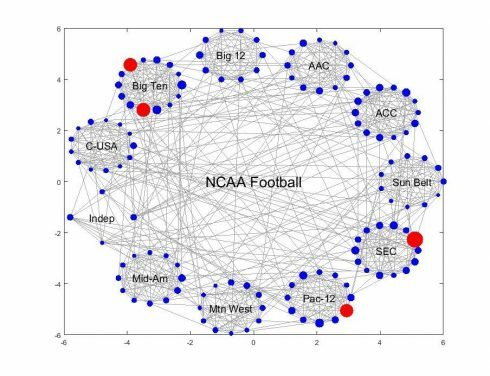 The final network graph (below) demonstrates the inter- and intra-conference play (the lines connecting the dots) as well as the relative strengths of the teams within their conferences via the dot size. Lastly, below are our predicted winners and win margins for 40 of the 41 bowl games. All of these bowls are assumed to be at neutral sites, so, for example, the Hawaii Bowl win margin does not adjust for Hawaii’s homefield advantage (a 5.25 point adjustment). After the two national semi-finals have been played we will return to predict by how much Alabama will win.